Tennis is more than a pastime. It's our passion. 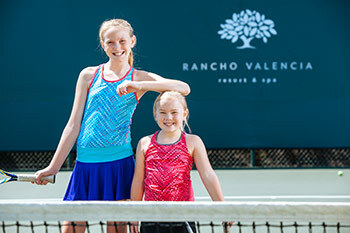 With a renowned tennis facility that offers something for players of every skill level, Rancho Valencia has been rated as Southern California's No. 1 tennis resort by Tennis Magazine consistently since 2008. A pastoral setting of bouganvillea and citrus groves offers a serene, scenic backdrop for the 2 European clay courts and 16 beautiful plexi-pave championship courts. A staff of experienced USPTA and USPTR certified tennis professionals are eager to help players reach their full potential on the court with lessons and programs tailored to the individual. For guests seeking a dynamic tennis experience, Rancho Valencia offers a Stay and Play tennis package combining a one night stay in our luxurious casitas with $175 tennis credit per person to use as you see fit. For more information on tennis programs, pickleball and menu of other activities offered at Rancho Valencia, please call our Pro Shop at 858.756.1123.